In the crossroads of many civilizations, experience the vibrant colors and intense flavors of Morocco! Learn how true Moroccans prepare their regional specialties with Arabic, Berber, French and Spanish influences. Access Trips announced their new Moroccan Culinary tour departing August 30th, October 11th, November 8th, and December 20th. Cooking instructions from Masters of Moroccan Cuisine. You will learn how to prepare local foodssuch as fish tajine, barbeque kebabs, and traditional lemon chicken. A retreat to the artistic old fishing village, Essaouira, where you will relax at a seaside lunch, ride acamel, and tour the local art galleries. 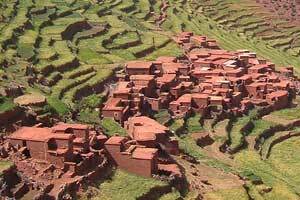 A tour of the Berber Village, Anrar. You will become accustomed to the regional traditions and enjoy a cup of Moroccan tea with a local family. Explore the High Atlas Mountains where you will experience a real Berber market where villagers come to trade. You will also visit an ancient Jewish village where you will meet the last Jewish man in the valley protecting the tomb of alegendary rabbi. A visit to the Imperial City of Marrakesh, where you will explore the Bahia Palace, the ancient royal Saad ian Tombs, the historic Jewish mellah and the majestic Koutoubia Mosque. A day wondering through the Markets of Medina, where you can take in the sights and shop for some of Morocco’s greatest craftsmanship. You will also witness the magic of Djemaa el-Fna Square, where local snake charmers, Berber acrobats, fortune-tellers, musicians and engaging storytellers line the streets. Each day you will return to the wonderful accommodations in beautiful riads. These are Moroccan homes featuring an interior courtyard and garden, wither looking over the majestic sea or High Atlas Mountains. Call Access Trips at (650) 492-4778 to book your trip!